The flight plan of your trip so that we can organize your welcome and your stay in Rwanda in good condition. The complete list of the members of your delegation : Chef of Delegation, Members of your direction, Riders, Sports Staff members, ... We must communicate this list to the Immigration Services to facilitate your arrival. Your choice hotel for your accommodation during your stay in Rwanda. For all residents of African countries, the formalities to obtain the Rwanda Entry Visa are made directly upon arrival at Kigali International Airport. No other formality is to be done before. If you need an official letter of invitation for the exit of your territory, thank you to ask us by e-mail (olivier@gso-sport.com) giving us the complete list of the names to be noted on this letter. Note that the visa costs 30 us $ / person and that it is not possible, as in some countries, to obtain "free" visas ! Everyone has to pay this visa. At your arrival at the airport, after having received your visa and collected your entire luggage, a minibus of the organisation will transport you to the hotel. The transfer will be quick as the airport is situated between 1 km and 3 km from the different hotels. After the Championship, the transfer to the airport will be done in the same way, in the other direction. For Nations with at least 10 riders participating in the entire Championship. The Organizing Committee will make available a vehicle (Toyota Corolla type) for the duration of the Event. This vehicle (which will not be equipped with a bike rack) will allow the members of the delegation to go on the circuits and to go to the different meetings. It will also used to follow riders, both in time trial and circuit races. Fuel is the responsibility of the Nations. For Nations with less than 10 participating riders. For Team Time Trial races, to follow their team, 1 hour before the first start, a vehicle (Toyota Corolla type) will be available for each Nation to follow their team during the race. For the Individual Time Trial race, at the start of each event, to follow their riders, 1 hour before the first start, a vehicle (Toyota Corolla type) will be available for each Nation to follow their rider during the race. In these 2 cases, the vehicle will be given to the Nation on the starting car park of the Time Trial. This vehicle will not be equipped with bike rack, and must be returned to the Organizing Committee just after the arrival of the rider or the team, on the arrival place of the time trial (same place as the departure). For road races in circuit, for Nations not having a vehicle for the entire duration of the Event (so less than 10 participating riders), vehicles will be provided to follow the races, by grouping one or more Nations in a vehicle according to the number of riders engaged in each event. There will be one, two or three Nations in a vehicle, depending on the number of riders. These vehicles will be given to the Nations at the departure car park closed to the finish line. These vehicles will not be equipped with bike racks, and must be returned to the Organizing Committee just after arrival on same place. On the other hand, minibuses of the organization will assure the connections with the venues of departure / arrival of the races, starting from the 3 official hotels at precise and definite schedules in advance. Note that the circuits (Time Trial and Road race circuits) being very close to the hotels, the riders will go directly to the circuits by bike ! The vehicle will be available on November 2018, Tuesday 13th, from 10:00 am to 12:00 pm at the organization’s headquarters, CLASSIC HOTEL in KIGALI. For insurance regulation, this vehicle must always be driven by the same person from your delegation. He will have to present his international driving license at the time of the delivery of the vehicle. The vehicle must be returned no later than November 2018, Sunday 18th, from 2:00 pm to 4:00 pm at the organization’s headquarters, CLASSIC HOTEL in KIGALI. You can rent one or more vehicles from our Official Supplier (VAVATOURS in KIGALI) from February 2018, Saturday 10th. Toyota Corolla type vehicle : 40,000 FRW / day (around 40 €uros / day), excluding fuel. Vehicle type pick-up double cabin : 90,000 FRW / day (about 90 €uros / day), excluding fuel. Booking and payment is done directly with our Supplier VAVATOURS : info@vavatours.com and by putting us in copy (olivier@gso-sport.com) so that we foresee the accreditation of this vehicle. 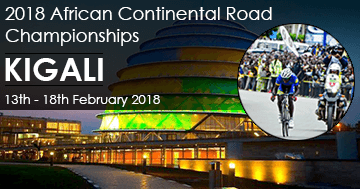 The Organising Committee has negotiated with 3 hotels in order to find best possible solutions for your stay in Kigali, such as granting good rates, the proximity to the race courses and the general conditions of your accommodation. The 3 selected official hotels are all less than 3 kilometers from the race and start / finish of the road races in circuit, and less than 6 kilometers from the start / finish of the Time Trial races. The CLASSIC hotel is completely reserved for the organization and the Rwandan Cycling Federation. The permanence and the technical meetings will take place there. No other delegation or member of another delegation may be accommodated at this hotel. Note that if a complete Nation, Heads of Delegation or Presidents of the Federation do not wish to be accommodated at the same hotel as their riders and their technical staff and prefer to stay in a hotel other than those proposed by the Organization, no special shuttle will be organized for them to go to the races or to various meetings or ceremonies. The organizing committee negotiated the best possible rates according to the quality of services provided by these hotels. For all hotels, rates are in bed and breakfast. You also have the price for lunch and dinner. The meals served will be "sporty" type. At the earliest, as soon as you know the number of people in your delegation, and for better management of this very important organizational position, it is necessary to book your accommodation with the hotel you have chosen, by sending the booking form (annex 2 accommodation) directly to the hotel, and putting us in copy so that the Organizing Committee can follow the evolution and validation of reservations. No reservation can be made directly by the Organizing Committee. Your reservation must be made no later than February 2018, 1st. The hotel will acknowledge receipt of your reservation and will confirm it by e-mail. Once validated by the hotel, your reservation will be definitive. Any reservation is definitive, and will be due to the hotel. It will not be possible to change hotels on your arrival or during your stay. The hotels have been carefully selected and conform to the advertised services. Upon your arrival at the hotel, the hotel will present the bill (depending on the number of rooms, the number of people and the number of days) that you must pay immediately, so as not to cause problems at the end of your stay. All possible extras must be paid to the hotel during your stay. Again, for more convenience and better organization, it is imperative that you provide us with advance information on your flights (date of arrival, date of departure, flight number, schedules, ...). Accommodation being an essential aspect of your stay, thank to do the necessary very quickly. The organizing committee wishes you a pleasant stay in Kigali and thanks you in advance.